For as long as pigments have been made and ground up the rule of thumb has been, the farther along the visual spectrum you go the harder and more expensive it gets to create that color. Blue has had a double hit to it’s reputation in that the best solutions to it’s creation have the after effects of being poisonous (cobalt blue is a possible carcinogen and Prussian blue, another well-known pigment, can leach cyanide) absurdly expensive (the ground up gemstone lapis lazuli is what makes up ultramarine blue) or if done on the cheap using organic materials apt to fade extremely quickly. That was until recently when researchers at Oregon State University created a new, durable and brilliantly blue pigment by accident. 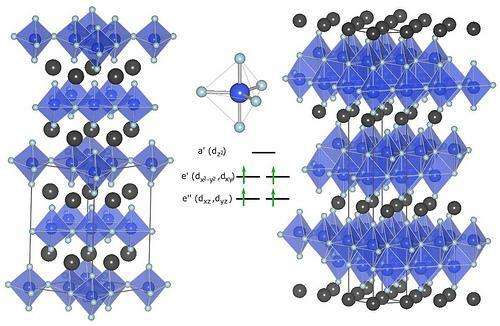 The researchers were trying to force novel electronic properties into compounds like manganese oxide ( Black ) & other chemicals by using extremely high temperatures (2,000+ degrees Fahrenheit) to force crystal structures. During one series of experiments the Professor of material sciences, Mas Subramanian noticed that the latest sample of manganese ions absorbed red and green wavelengths of light and reflected only blue. When cooled, the manganese-containing oxide remained in this alternate structure. The compound still is not as cheap as they might like due to the use of indium but work is being done to replace the indium oxide with less expensive oxides like aluminum, which possesses similar properties. More can be read in the latest Journal of the American Chemical Society.